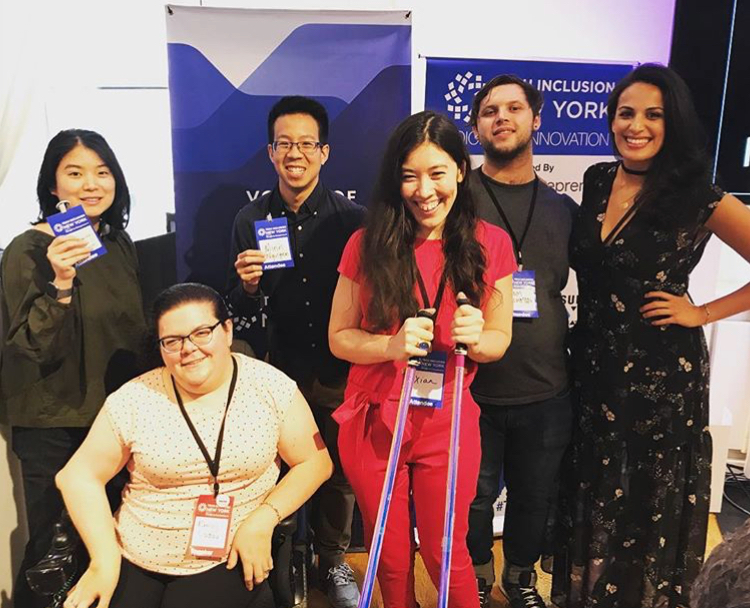 Diversability community members enjoy their time at Tech Inclusion New York. My first year attending Tech Inclusion New York left me with some very strong feelings. I’d found it so intellectually stimulating, but felt disappointed at the level of inclusion of people with disabilities. What I think I took for granted while writing my recap of the 2017 conference is the sheer amount of time, energy, and other resources it takes to both facilitate and coordinate an event like this. I’m happy to say though that I think Tech Inclusion’s co-founders, Melinda and Wayne, took my criticisms to heart, as the attention to detail in ensuring that the venue was a safe space for everyone was palpable. The lineup of speakers this year felt like a broader representation of varying identities, with discussion topics themselves farther reaching than last year, too. One of the most eye-opening panels of the day was called “Stories and Solutions: LGBTQIA & Traveling for Work.” While I had a vague idea of the challenges people from this community face when traveling, hearing the personal stories from the panelists was powerful. One panelist described how they sometimes wait for specific TSA agents when going through airport security if they perceive the agent may be less likely to question their identity. Another panelist described a standout feature to the gay dating app, Scruff, which sends users destination-specific safety warnings and information when they are traveling, such as an alert if a location has anti-LGBT laws. Ivy Teng Lei’s timely presentation about her experiences as an undocumented immigrant was also enlightening, especially considering the current political climate surrounding the immigration issue in the US. Both of these talks gave me a new perspective on the challenges faced by their respective communities. Another one of my favorite talks was by former marine, Neal Conlon. He spoke from his experience as a Marine Veteran, son of a single mom, and a father of two daughters about tokenism and how it doesn’t equate to inclusion. This is in large part due to the idea that hiring someone from an underrepresented background doesn’t mean that a given employer cares about that person or their contributions to the organization. If you hire someone “to check a box” without regard for their capabilities, it could just perpetuate a cycle of oppression, but if you hire a person or people from diverse backgrounds and listen to their unique experiences, it will add value to your business. It was great to see multiple people with disabilities represented in the speaker lineup this year. Emily Ladau spoke about disability representation. Learning that people with disabilities globally represent the world’s largest minority was incredibly empowering and validating. I used to tie so much shame to my disability, but as I get older I am increasingly proud of it, and I feel so grateful that I get to contribute to lifting this community up on a daily basis. Mariella Paulino also spoke about her intersectional identity as a deaf, Afro-Latina woman and the challenges that come with it. Alex Moura discussed the importance of exposing yourself to people and opinions that you disagree with and Rachana Bhide, David Silva, and Emilie Hsieh spoke about what it means to be an ally, how to build them as well as how to become one. Conferences such as Tech Inclusion provide me the opportunity to connect with like-minded individuals who are also doing their part to make this world a better, more inclusive place for everyone. Connecting with these people is not only gratifying on a personal level, but also motivates me to continue doing my part to have a positive impact. Thank you to both Diversability and Equal Entry for allowing me to attend and providing me a platform to share my experience. Originally posted on July 27, 2018 at Equal Entry. We are an award-winning social enterprise to rebrand disability through the power of community. We do that through curated events and partnerships, focused on reframing the disability conversation to one that is rooted in pride and empowerment.